We’re fortunate enough to live in a large city with a fantastic farmer’s market where we have access to an wide array of fresh seafood. I’m always up for seafood and considering that we’re going on a cruise to Asia in a month, and we’ll be in bathing suits, and we’re still fighting to lose those 10 pounds we gained this winter, shrimp and fish are making regular appearances on our table. I don’t know about you, but shrimp is so ubiquitous that I sometimes get bored with it. However, I adore crab, and shrimp adorned with crab meat is a whole new ballgame. Some preparations of crab stuffing consist mostly of breading and are short on crab. I always feel ripped off when I’m served this type of stuffing. This recipe contains only enough breading to help hold the stuffing together. Crab is the main attraction in this dish which is just the way I like it! Placing the cut side of a butterflied shrimp down provides the perfect base for the stuffing. The tail curls up over the stuffing and makes a beautiful presentation. Peel the shrimp leaving the tail intact. With a paring knife, slice into the outside of the shrimp and remove the vein. After removing the vein, make the slice deeper until you can spread the two sides of the shrimp. Place the cut side down and make a 1/2 inch slit in the middle of the shrimp. The slit helps to hold the stuffing in place. Place the shrimp cut side down on a baking sheet. Form one inch balls of stuffing and place on top of shrimp. Sprinkle panko bread crumbs on stuffing and drizzle with melted butter. Press the tail slightly into the stuffing. Cooking in two phases helps to ensure the stuffing is warmed throughout but the shrimp is not overcooked. The low temperature helps to accomplish both goals. After baking for 15 to 18 minutes, a few minutes under the broiler browns the panko bread crumbs and adds a little crunch to the finished dish. This shrimp dish is a great option for dinner parties because the shrimp and stuffing can be prepared ahead of time. You only have to bake them after your guests arrive. 2. Peel, devein and butterfly shrimp leaving tail intact. 3. Cut slit in shrimp, as seen above. 4. Pick through crab meat to remove any shell fragments. 5. Combine crab meat, breadcrumbs, garlic, lemon zest, lemon juice, scallions, parsley, mayonnaise, and mustard. Do not over mix. Add salt and pepper to taste. 6. Place shrimp on baking sheet. Form 1 inch balls and place on top of slit in shrimp as seen above. 7. Top each shrimp with panko breadcrumbs. Drizzle the top of each shrimp with melted butter. 8. Bake for 15 to 18 minutes. Remove baking sheet from oven. Heat oven in broiler mode. Place shrimp under broiler for 4-5 minutes or until breadcrumbs are browning. Watch carefully so shrimp don't overcook. I was wondering if I could use cooked shrimp for this recipe as I purchased it by mistake! Unfortunately, I don’t think the recipe will work very well with precooked shrimp. The shrimp would be over cooked by the time the stuffing is done. Sorry! This recipe was amazing! I made these for a Christmas party and everyone loved them. I had no panko so I had to use crushed club crackers. Which add a bit of a buttery taste without to much salt. Didnt think the slit would make a big difference but it really helps. This the best website I found with recipes that are not to complicated but taste amazing. Thanks! Thanks so much, Jason! I appreciate the feedback! My wife and I were recently in the mood for some Crab Stuffed Mushrooms. We had a recipe we had used many years ago that a chef/friend gave us and we loved it. But when we went to make it we couldn’t find our recipe. So we hit the Internet and came across your recipe. We thought we would give it a try. It met all of our expectations. So now we don’t care if we ever find our recipe…yours is now the go to!!! Thank you so much for sharing. Thanks so much for dropping by and leaving a comment, Steve! So glad you enjoyed the recipe! Hi Bill- Thanks for the step by step shrimp technique with great photos. Will be making this for my family Christmas dinner, cant wait to try it. Would brown rice go well with it ? I am glad I come upon your site. Thanks so much for the shrimp prep technique–so important as one cannot really “wing” that! Can’t wait to try this recipe, I already know it’s a winner!! what kind of breadcrumbs do you use in the stuffing? fresh, soft, white bread…dried plain…dried herbs…? Hi Isabelle, I would recommend plain dried or panko breadcrumbs. Either would work fine. Thanks for dropping by! Crushed buttery crackers seems like a nice sub for breadcrumbs. Just my thought, nothing irks me more than when someone makes great comments about a recipe, and then goes on and on about the 15 changes they made. LOL. This sounds like the right combo. I’ve got the perfect shrimp on hand and plan on trying it for this weekends NFL games. I think you’re right about Ritz crackers. They work well, but they will add some salt to the mixture so keep that in mind when you season the stuffing. Hope you enjoy the recipe and thanks for dropping by! Thanks for the feedback, Brian! I’m glad you liked it! This post is terrific. I have never seen that presentation tip about laying the shrimp cut-side down before. I am making this for my husband’s 40th birthday tonight, and can’t wait to see his face! Happy cooking! I appreciate you dropping by Southern Boy Dishes, Karen. I hope you like the recipe. Please let me know how it turns out. Thanks! Looks great, I will try soon. Appreciate the description on the preparation of the shrimp. Just made this today and was totally delighted with the recipe!! I find most of the recipes online have so many ingredients, I didn’t want to take away from the shrimp and crab taste by putting loads of other items. This was perfect!! Thank you!! Thank you for the comment, Debby! I’m really glad you like the recipe and I always appreciate feedback. I hope you and your family have a happy new year! I was looking for a stuffed shrimp recipe with crab meat for Christmas Eve and decided to try this one. Well they are in the oven now and look and smell absolutely delicious! Just a few more minutes to go…..yummmmm – Can’t wait! Thanks so much for dropping by, Cheryl! I hope you enjoyed the shrimp and I wish you and your family a very Merry Christmas! Hi Bill – will be taking this recipe to the south of France with me to enjoy with the fresh seafood there. That said, I have some Dunganess crab in the freezer that we caught ourselves earlier this summer so I might not wait!!!! Thanks for sharing the recipe. It looks amazing. Thanks so much for dropping by, Shelley! Let me know how you like the recipe. I have a question about this step it’s a bit confusing: Top each shrimp with panko breadcrumbs. Drizzle the top of each shrimp with melted butter. Will the panko breadcrumbs be on top the shrimp before putting the stuffing or after? What about the melted butter? Will it go after or before i put the stuffing? Please answer asap. Thanks. Good question and I think I can update the recipe to be more clear. After topping each shrimp with stuffing, sprinkle stuffing with panko breadcrumbs, and drizzle butter over the breadcrumbs. Hope this helps. Let me know how the recipe turns out and thanks so much for visiting SBD!! Appreciate the quick response Bill,.will definitely let you know how it goes. Thank you so much. Thank you so much. I really appreciate to good feedback! I made these today. They were delicious. My daughter wants me to make them for her graduation. So glad you enjoyed them, Cynthia. I really appreciate you letting me know. I always love getting feedback on my recipes. Happy New Year to you and your family! Thank you so much for the feedback, Kathy! I’m so happy you all enjoyed the shrimp. I always love hearing from my visitors and I’m so happy this recipe worked out for you. Thanks for visiting SBD and I hope you’ll come back soon. Happy New Year! OH YES< I will come back soon..Will share that I was thinking to use this stuffing in Portabello's as well as I do have some non Shrimp eaters.. I love how detailed this recipe is. the pictures are a great help as visual adds help answer some questions I may have had in reading the recipe. I am adding this to my menu for my Christmas dinner menu this year. Maybe I can talk Felix into making this tonight! I love everything about this appetizing dish. 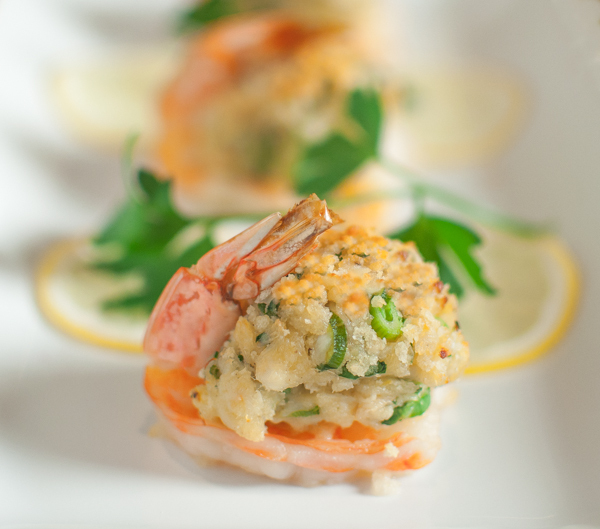 Crab cakes meet shrimp. Thank you! My husband fell in-love with some crab stuffed shrimp. He asked me if I could make it. “Sure, honey” (I lied). Ha! Now I can. Beautiful presentation.